The conservative Facebook page “The Committee to Defend the President” posted a meme claiming that the U.S. had become a net exporter of oil for the first time in 75 years. “The U.S. Just Became a Net Oil Exporter for the First Time in 75 Years,” reads the Dec. 12 meme. The meme cited a factually incorrect Bloomberg headline. While the U.S. did briefly become a net oil exporter on a weekly basis for the first time since at least 1991, there is no evidence to suggest it became one for the first time in 75 years. Weekly data only goes back 28 years. The Bloomberg story reported data from the Energy Information Administration (EIA) that showed that from Nov. 24 to Nov. 30, the U.S. had net exports of 211,000 barrels of petroleum per day, marking the first week exports exceeded imports since the agency began tracking weekly data in 1991. Petroleum is a broad term that includes crude oil and petroleum products such as gasoline, diesel fuel and ethanol. The term is sometimes used interchangeably with oil. Since weekly data only goes back to 1991, about 28 years ago, there is no evidence to suggest this is the first time it has happened in 75 years. This “mid-1940s” reference appears to be where Bloomberg gets its 75-year mark. But, as the article states, this is based on annual data, and in annual terms, the U.S. is not a net exporter of petroleum and in no sense “just became” one. The U.S. imported a net of 3.8 million barrels of petroleum a day in 2017 and has not been a net exporter of petroleum on an annual basis since 1947, according to data provided to The Daily Caller News Foundation by the EIA. Annual data for 2018 has yet to be posted, but monthly and weekly data suggest that the U.S. will remain a net importer. The Bloomberg article does state that weekly data goes back to 1991, but its headline inaccurately conflates the weekly and annual data sets (“just became” and “75 years”). When contacted for comment, a Bloomberg News spokesperson told TheDCNF that the organization stands by the story and its headline. The Facebook group “The Committee to Defend the President” did not respond to a request for comment. While the week of net exports is a notable achievement, the switch only lasted that week. The following week, the U.S. reverted back to being a net importer, importing more than 1 million barrels a day. The four weeks before that last week of November, the U.S. averaged over 2 million barrels of imports a day. The U.S. has made significant strides in reducing imports of petroleum and increasing exports. The U.S. imported 3.7 billion barrels of petroleum in 2017, compared to 5 billion in 2005. U.S. exports rose from 425 million barrels in 2005 to 2.3 billion in 2017. 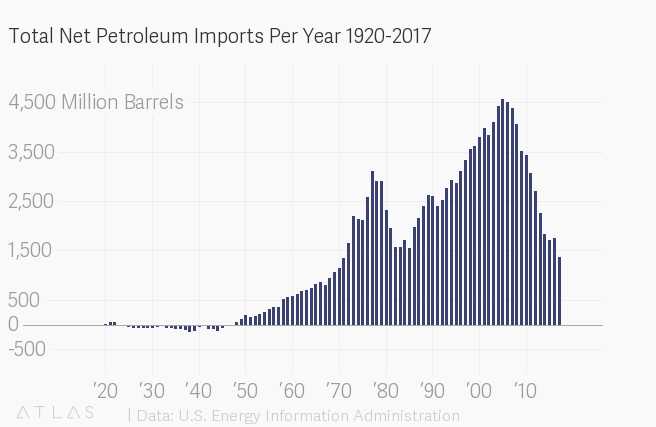 The decrease in net imports is largely due to a boom in domestic production of crude oil, spurred on by the advent of hydraulic fracturing, or fracking. U.S. field production of crude oil nearly doubled from 2008 to 2017, jumping from 5 million barrels a day to 9.4 million. The EIA estimates that crude oil production in 2018 averaged 10.9 million barrels per day and could reach over 12 million in 2019. With production booming, the U.S. lifted a 40-year-old ban on most oil exports in 2015, which also contributed to a decrease in net imports. As president, Trump has moved to open federal lands and offshore areas to drilling.